Henry Clay Ford and Wilber Shaw, three time winner, prepare for the start. 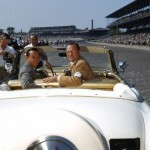 Grandson of Henry Ford, William is the fourth member of the family to drive the pace car at the 500. 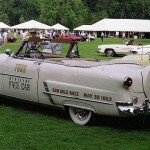 The Pace Car prepares for the start of the 500 mile race. 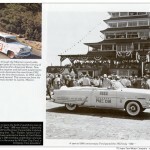 1953 is the fifth time a Ford-built passenger car leads the field for the start of the 500. Restored Pace Car on show. 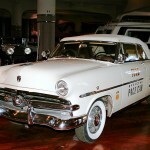 Pace car at the Henry Ford Museum in Detroit. 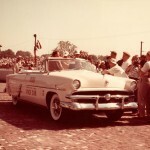 1953 was the 50th Anniversay of the Ford Motor Company. 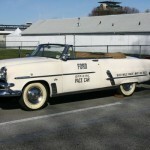 A beautiful restoration of the 1953 Ford V-8 Sunliner convertible Pace Car.